Do you own a home or professional weather station or just considering the purchase? Thinking about easy and comfort way to view measured data? Would you like to have readings from your weather station accessible from anywhere - literally "the world" - and not just from two meters in front of the display? Do you intend to put your weather information on the website? Do you want information about actual weather conditions and its development at any time not only in your neighborhood? ... then the following lines are addressed to you and we are happy, if you spend a little time and attention reading this article describing software Stribog. Since mid-2008 we, here in Amenit s.r.o. asked each other such questions how to find the cheapest and most elegant solution. Answering these questions (and maybe more), we considered interesting "challenge", so we, led by the initial vision, armed with a good dose of enthusiasm and relying on the skill of our programmers and web developers, get to work. Soon was the basic software released, it was christened "Stribog" and since the first "baby" steps from version to version, it was clear that this toddler in itself suggests a considerable potential and development opportunities. After 2 years of effort, help and sometimes even forgiveness of our loyal users (not just when something went wrong and "mistake appeared"), we dare say that this idea work together and Stribog, though still young with a lot before him, should not be ashamed of anything. Stribog Although not yet quite ready for professional use, is a convenient application for enthusiasts interested in current weather in their area. Number of our users is constantly expanding with Stribog weather stations being placed on balconies, rooftops and gardens of amateur meteorologists. Stribog can be alsi found on many golf fields, amateur airports, Yachting Clubs, as well as in office buildings, hotels and cottages. Some users come from outside Czech Republic (Sweden, Russia, Slovakia, Canada). Stribog is stored on the flash drive and when connected to a USB port on your router ASUS WL-500gP is able to periodically download data from weather stations, which are connected via the USB cable into second USB port on the router. Stribog saves measured data on the Flash Drive into a special database, creates a web interface on the router (local web interface accessible from the internal network as well as "from outside") both the measured data and information about weather station sends to the central meteoserver (www.homeweather.net) . 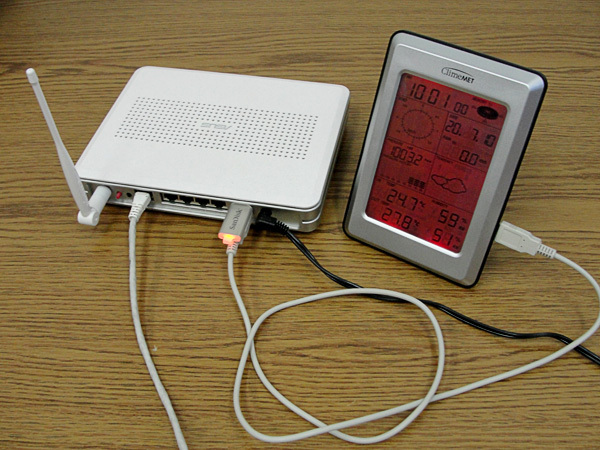 As mentioned above - reads data from weather stations at intervals of 5 min., stores the measured values from all available sensors on the Flash Drive and communicates with our meteoserver www.homeweather.net. 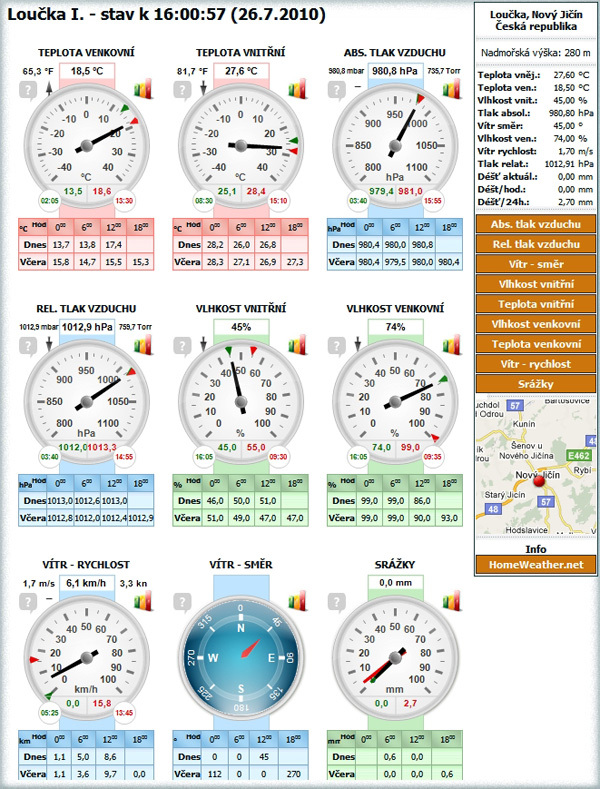 Displays all current values both in a graphic design (gauges) and plain text (quick overview). Displays the minimum and maximum readings. Displays all the data measured in elapsed time in graphical form daily (last 24 hours), weekly and monthly overview. Creates statistical summaries of individual variables (minimum, maximum and average values per day, week and month). Can "fill" holes in the data, caused by failure in the measurement (router power lost, etc. ), after "reboot" Stribog loads memory data from weather station in addition to current values. Allows you place individual sub-components (gauges, quick overview, specific graphs) on your own website. The big advantage is the ability to autoupdate Stribog directly through its own local web interface via Internet downloading package from a central meteoserver. In web settings one can choose units and readings of displayed data to be displayed in quick overview and graphically as gauges. In graph settings one can choose which graphs will be generated and which of them will appear on index page (below gauges). At the end of May 2010 we published our meteo website www.pocasi-doma.cz (www.pocasidoma.cz) a www.home-weather.net (www.homeweather.net) which lead to meet other objectives and gradually realize our initial vision. create one central server for our community of registered users (for other public), where they will be able to share data gathered from their stations and get an overview of the weather and its development not only at their weather stations. develop a central web application that will allow us to more easily manage Stribog, add functionality to accelerate development and bring even greater user comfort of showing measured data (better gauges, more understandable graphs, trend measurements, ...). reduce "dependence" on the local router, especially in cases where it is difficult to provide a local web interface Stribog to the Internet (for example, in the absence of public IP addresses, etc.). create space for better communication with our customers (newsletters, articles, important information in one place for all). 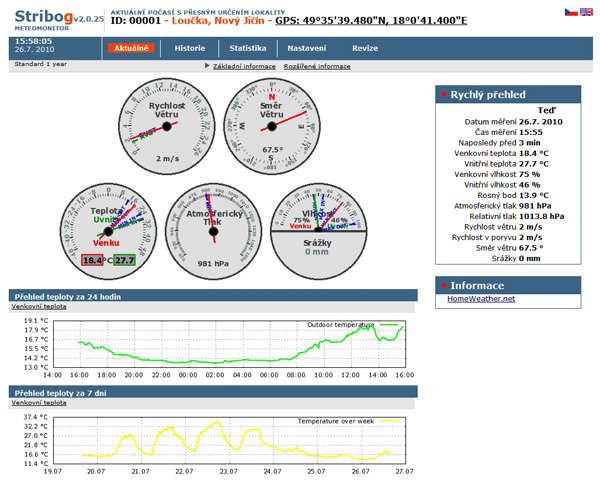 Stribog is also released in version 2, which retains all the features of a local web interface on the router, including data storage on Flash Drive, but it also sends all user settings and all data measured at regular 5 minute intervals to meteoserver. fast web server with continuous availability, accessible easily from anywhere. automatic, regular backup of their data measured on our server (in case of flash drive failure one will never lose his data stored on meteoserver and when it is necessary to reinstall the local Stribog flash drive there is also opportunity to read all user settings back). view of their historical data through a meteoserver web application in cases such as where there is a shorter or longer local network or internet outage. information and news about the development and Stribog meteoserveru always up to date. In addition, each registered user after logging in with his assigned username and password can edit information about your weather station and modify its settings (location, location, name, elevation, mark your station for non-public-private ...) directly on meteoserver. If you like the above-described Stribog interested, you can try it for free. How? Installation instructions can be found on this website in the article "Trial version", where there is a manual, installation conditions and supported weather stations. If your installation succeeds, and make registration on our meteoserver(see article above), then you will automatically be assigned a license Stribog "Free", which is fully functional for a period of one month (after expiration it is only available to view the current values on local web interface, no graphs). Buy "full version", meaning license "Standard" you can using order form or in our e-shop www.meteosonda.cz. If you have any questions, if you need advice or help with installation Stribog, then please do not hesitate to contact telephone numbers: +420 556 706 203, +420 222 360 250 or e-mail: podpora@amenit.cz , obchod@amenit.cz. Your interest please us and we will devote some time for you.